If you are familiar with Marc D’Andre and you follow him on Facebook, its a good possibility that you know about The #RockItOrStopIt segment. This is a platform that Marc introduced thru Facebook Live where he takes music submission from artists from around the world, and plays the music in stereo during live Facebook broadcasts, giving the audience a chance to critique the music and give the green line on if it should be hear din regular rotation on 7mileradio.com or not. This also give artists a chance to hear unbiased, uncensored real opinions about their music, outside of their immediate circle of friends who may “yes man” them into believing they have what it takes ! 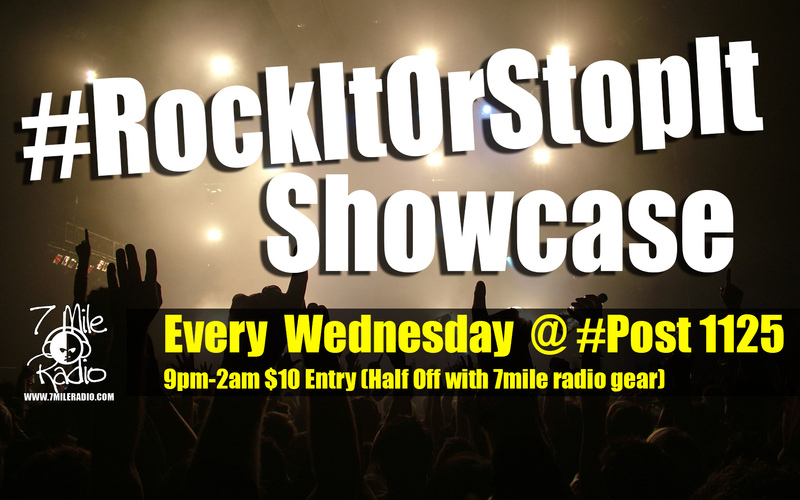 The #RockItOrStopIt LIVE Showcases will take the online version of the segment, and turn it into an “in your face interactive concert” where audience members will be picked as judges for the nights performances. Not only will this give artists a chance to have their music heard, and a chance to showcase their stage presence and showmanship, but artists who receive the approval from the audience and judges will be eligible for radio rotation, live in studio interviews and slots on promotional mix tape series that will be released by 7mileradio.com to showcase the best of the best that we come across. There will be 7 performances each Wednesday at Post 1125 (15403 Harper Ave. Detroit MI.). Below is a registration form for artists who wish to perform. The list of possible performers will be complied from the registration emails. Artists will perform according to the performance sign up list at the venue the day of the show. Registration on the site DOES NOT guarantee you a performance spot. Artists who sign up to perform at the venue who have not registered on the site will be disqualified.